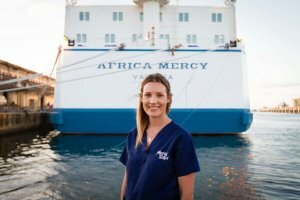 Hannah Rutherford recently volunteered with the world’s largest civilian hospital ship, the Africa Mercy. 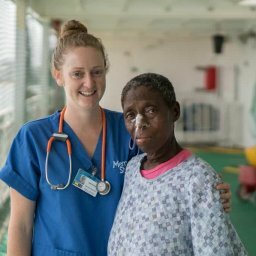 The Mercy Ship was docked in Madagascar, and Hannah describes how she was impacted professionally and personally as she worked alongside the international teams providing healthcare services to people in extreme poverty. 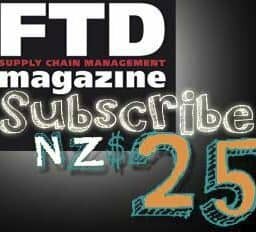 After studying at Otago University and graduating in 2010, Hannah worked for Counties Manukau District Health Board for two and a half years before moving to Sydney in 2013. In Australia I work at the Sydney Adventist Hospital as a cardiorespiratory physiotherapist. 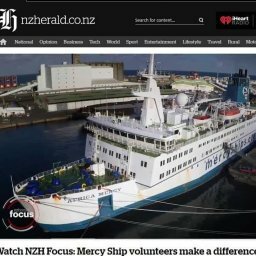 “I first heard about Mercy Ships from a colleague whilst working as a rotational physiotherapist at Middlemore Hospital for Counties Manukau. Her enthusiasm was contagious. My desire to travel and learn about another culture meant this organisation caught my interest immediately. 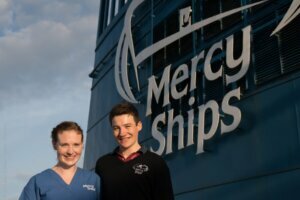 What I didn’t realise at this early stage was that the Mercy Ship would offer me so much more than an opportunity to work abroad as a physiotherapist,” says Hannah. 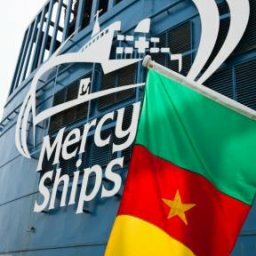 Mercy Ships is an international NGO that has operated a fleet of hospital ships in developing countries since 1978. They enter port cities at the invitation of a country’s government. They then work in that country alongside government, international and local NGOs and local church partners for 10 months of field service Their aim is to support a country’s health delivery by providing training and completing medical-capacity building projects. This leaves the country with a much stronger and sustainable healthcare system at the completion of the field service. Throughout each field service they also address immediate healthcare needs by providing thousands of free surgical services that are not available within the host nation. Hannah had the privilege of living and working on the Mercy Ship from January to May of 2016. The Africa Mercy houses a crew of 450 volunteers from around the world. The lower level of the ship is largely taken up by the hospital. The ship has five operating theatres and eighty inpatient beds over five wards. It is supported by dental, pathology, radiology and, of course, rehabilitation services. Hannah worked as a member of the rehabilitation team alongside four other physiotherapists and two occupational therapists. The main role of the rehabilitation team is to provide therapy services to patients receiving orthopaedic or plastic reconstructive surgery. The team also treats patients from any specialty if a need arises, and even members of the crew for urgent musculoskeletal conditions. 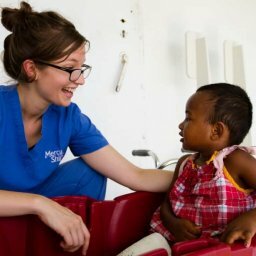 Whilst in Madagascar, Mercy Ships provided 99 orthopaedic and 102 plastic surgeries, in addition to hundreds of other surgeries, free of charge. The rehabilitation team worked on the wards and in a military-style tent on the dockside. The tent at times housed six therapists and five interpreters, all working with patients and their families at the same time. This, along with the language and cultural barriers, limited resources and a restricted time frame, added to the challenges we faced with the clinical work they were doing. “It was the craziest, but equally the most supportive, work environment I have ever been in. Many of the conditions we treated were made more complicated by the delays in the patients accessing health services,” says Hannah. “I met Jimmy on my second day in Madagascar. 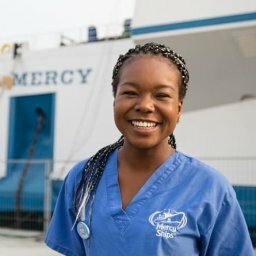 Mercy Ships had offered him a below-knee amputation, and he presented limping, with his leg wrapped in a filthy blanket and covered in flies. Jimmy told us his leg had been badly burnt when he was 11 years old, and the wound had never healed. Now aged 28, his leg was so badly infected the bones were exposed and he could not weight-bear on that leg. Mercy Ships offered him a below-knee amputation, and following this Jimmy’s rehab was initially straight forward, involving stump bandaging and strengthening work. Our first real challenge came when we decided to make a temporary prosthesis so that he could start partial weight-bearing. This involved some trial and error with the resources we had on hand, but we eventually had an effective prosthesis made out of casting material and the end of a crutch. Jimmy’s progress was nearly derailed by the growth of a bone spur at the end of his tibia. The original surgeon’s volunteer service had concluded by then, so we asked around the group of surgeons on board at the time if anyone would be comfortable operating on him. One plastic surgeon, whose specialty was facial surgery, offered to help. West Africa is a completely different world to ours. It smells different, it looks different, the traffic is chaotic with motorbikes coming from all directions. One of the most significant differences, however, concerns the health system. It is basic and insufficient to serve the people of the country, not to mention that accessing even the most basic healthcare services can lead families into bankruptcy. Most people just learn to live with preventable and treatable conditions. This year I had the opportunity to volunteer my time and IT skills in a West African country called Benin. 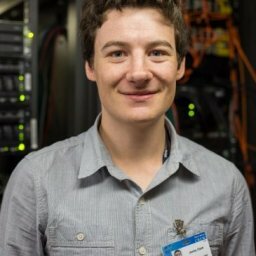 I volunteered as an IT support specialist for an organisation called Mercy Ships, on board the Africa Mercy for three months. 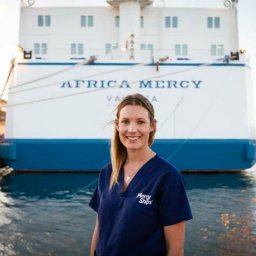 The Africa Mercy is a hospital ship which provides free surgeries and medical training to countries along the West African coast. Providing medical capacity building, surgical procedures and post-operative care to the highest standard, the Africa Mercy impacts thousands of lives in each country they dock in. 24/7,when you do a job for someone you not only feel that you are helping the people of Benin but you also feel like you are helping out friends. This gave me a real sense of accomplishment in my job. 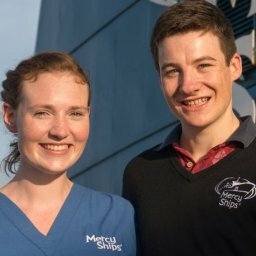 Volunteering for Mercy Ships has reminded me that customers and patients are the main reason I come into work every day. The effort I put into developing quality software will ultimately result in a better experience for those consumers and patients. 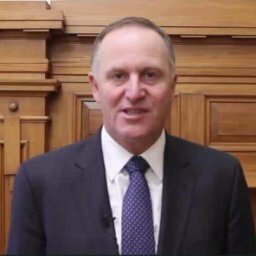 I have also realized how blessed we are in New Zealand to have a reliable and affordable health system. There are so many factors in Benin preventing people from getting the care that they need. So let us be thankful this Christmas that we have the facilities and resources needed to have a safe and enjoyable holiday. Benin, a small West African country between Togo and Nigeria, has severe resource constraints and a population of 10 million with limited access to health care. 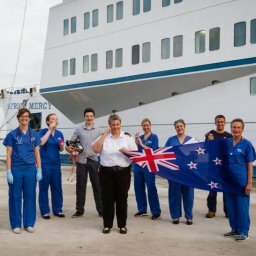 Mercy Ships will be in Benin for 10 months providing a range of surgical specialities: plastic and general surgery, gynaecology (fistula repairs), ophthalmology, orthopaedics, limited neurosurgery (specifically encephalocele cases), and dental and maxillofacial surgeries. I found the Mercy Ships set-up to be very welcoming, professional and well equipped. Long before the ship had arrived in the country patients had been screened for suitability. Initial screening took place in both metropolitan areas and in isolated rural villages with teams from the ship travelling far into the interior. The ship offers elective surgery for only benign disease and only where the course of treatment can be completed over the course of the ship’s stay. 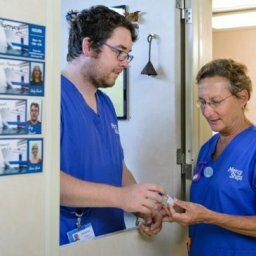 Prior to their arrival on the hospital wards, patients had been checked by an experienced rural Australian GP, who had arranged for their bloods tests, ECGs and radiology. Severe hypertensives were postponed and started on treatment. Time had been spent counselling the patients in their own language about what was being offered, and expectations and likely outcomes. Final surgical consent was obtained the night before surgery, often with an inked thumb print. The hospital is well resourced with five operating theatres, a post-anaesthesia care unit or PACU, an intensive care unit with adjoining high dependency unit (with the ability to ventilate post-operative patients), four post-operative wards, full laboratory services including transfusion – you have to love warm, whole blood when the suction bottle has reached the seven-litre mark – and radiology, including CT, ultrasound and plain film. Post-operative physiotherapy and extended-duration hand therapy was available. From an anaesthetic perspective the theatres had Mindray anaesthetic machines, circle systems with Iso and Sevo volatile agents, oxygen/air mix, end tidal agent monitoring and the capacity for invasive monitoring in selective cases. A range of fibre-optic scopes were available along with C-MAC and Air Trac. Ultrasound was easily accessible for regional anaesthesia. Every theatre had an anaesthetic consultant and trained anaesthetic assistant. The surgical pathology over my stay was varied, the sub-speciality surgery being dependant on the specialist skills of the surgeon who was onboard the ship at the time. I did plastics lists with lots of burn contracture-release surgery, removal of massive facial neurofibroma, MaxFax cases of ameloblastomas the size of watermelons requiring awake fibre-optic intubation (AFOI), subtotal mandibulectomy and plate reconstruction, lots of hernia repairs, and lumps and bumps. There was a mix of adult and paediatric cases. There were plenty of times that I wished I had paid more attention during fourth form French classes but translators were readily available throughout the patient journey. Local people were very multilingual and one could always communicate with patients in one of their own languages including at induction and emergence. The surgical wards were a very communal affair. It would be common to be seeing a patient for the next day’s list, asking questions about their past anaesthetic exposure, allergy or surgical pathology only to have those questions answered by the patient in the next bed with advice from visitors across the room. One notable general surgical list had three adjacent patients with four hernias between them. Much discussion ensued as to who had the biggest hernia, the stonemason, the fisherman or the jailer-turned-security guard. In the end the ward decided the fisherman was the victor given that he was scheduled for a bilateral hernia repair, but no one believed his account of the size of the fish he caught. The stonemason clearly had the toughest hands – mine were pronounced to be like a young girl’s – and the security guard laughed that the very people he was paid to keep in, he was now paid to keep out! It was certainly a unique pre-admission clinic! 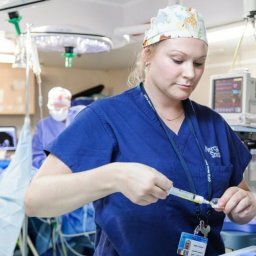 With help from Mercy Ships and through contacts with the World Federation of Societies of Anaesthesiologists (WFSA) – thank you Wayne Morriss – I was able to spend two days at two local university hospitals observing. I was made very welcome by the two professors who patiently showed me through their institutions and allowed me access to the theatre complex. In Benin, medicine is a seven-year fee-paying course, at the end of which most graduates endeavour to specialise as soon as possible. There is no universal health care; patients pay for medical treatment. Consequently Obstetrics and Gynaecology is the most popular choice given the young population and high birth rate. Specialist training takes four years during which the registrars receive no salary for their work. The anaesthetic workforce statistics reported to me were staggering. 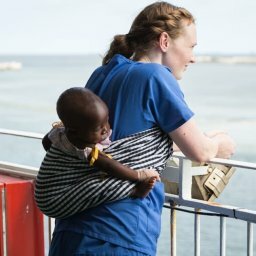 Consistent with most of sub-Saharan Africa, Benin, with 10 million people, has 22 medical anaesthetists, and not all of them are in clinical practice. There are 250 nurse anaesthetists who do the bulk of the clinical work. The nurse anaesthetist school in Cotonou has trained 200 of the 250 but has been closed for the last two years. 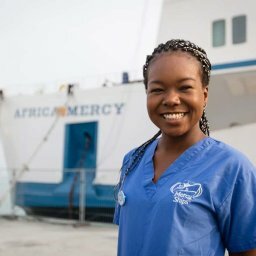 Part of the role of Mercy Ships in Benin is to assist with medical capacity-building and education as well as clinical care. Accordingly they are running courses in sterilisation techniques, promoting the WHO Surgical Safety Checklist – which is not widely used – and promoting the need for a surgical count at the end of surgery to ensure all swabs and instruments are accounted for—also not used in the theatres I observed. 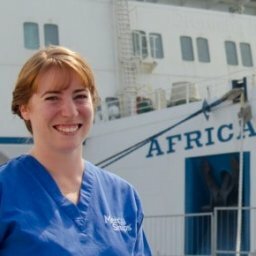 In addition local surgeons and anaesthetists spend time working along expatriate specialists in the theatres onboard the Africa Mercy. While in this environment, as a husband and father it was hard not to wonder what life would be like for my loved ones should the place of their birth have been different. It was a privilege to be able to make a small contribution to the lives of some very vulnerable people. 2.5 min VIDEO: Unable to walk far enough to get to school, this bright little girl and her family were heartbroken over what her future would be – until they heard about another girl whose legs were straightened for free by Mercy Ships. Fifalina’s tenacity and zest for life will brighten up your day in just 2.5 minutes! Serving as a hospital chaplain was not on Koffi’s radar when he completed a Bachelor of Finance degree, but he had felt ‘called to ministry’ since he was a teenager. It all began when Koffi was visiting another church in his home nation of Benin one Sunday, and he met a group of Mercy Ships crew members. He had never heard of this organization before, but he felt compelled to attend their day worker interviews the following day. The Advance Team were selecting Beninese to work as interpreters and translators for the Africa Mercy’s upcoming 2009 field service. 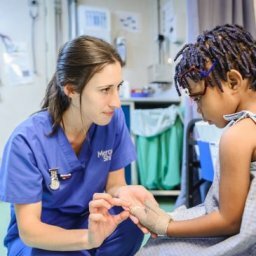 In each nation Mercy Ships serves, a large number of local dialect and trade-language speakers are needed to help our teams effectively communicate with our patients. The necessity of receiving accurate patient history, clear medical permission, and explaining surgical information simply, is only the tip of the iceberg. Koffi’s first season of service as a conduit of communication for Mercy Ships was in the Hospital OutPatients Extension (HOPE) Centre in Benin. He loved the work so much he traveled to neighbouring Togo to continue his interpretation work in the following field service. After returning to his job in Benin for a year, Koffi felt the irresistible pull back to Mercy Ships. His heart for God and his passion for people made way for further work as a translator in the ship’s on board hospital. Later he served as a trainer for the incoming French-speaking Guinean interpreters. In 2013 Koffi signed on articles as a long-term volunteer crew member. This time his area of ministry was as a team leader in the ship’s dining room. As Koffi set his hand to the practical tasks before him, he also volunteered additional time in the ship’s wards; praying with and encouraging the patients and their caregivers. Koffi’s passion for our patients saw him invited to serve as a full-time hospital chaplain the following year. Fenosoa and Papa Denis have a very special relationship. Although Fenosoa’s family live in the same Madagascan village, he shares a hut with his grandfather. Why? “Because he loves me,” explains his grandfather, Papa Denis. Fenosoa was born with a cyst on his side. For five years it grew along with the little boy, sometimes making him lose his balance. Papa Denis heard a radio broadcast about Mercy Ships providing specific free surgeries in Madagascar. The family was elated. So the tenacious 86-year-old and his pint-sized grandson walked for five days to reach the nearest public transport. 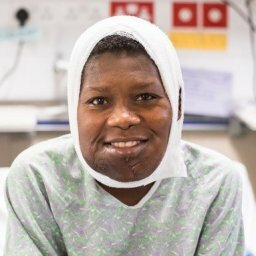 Over three more days, mini-buses brought them progressively closer to the Mercy Ship … and the surgery Fenosoa desperately needed. The screening team said Mercy Ships could help Fenosoa – but the 2014-15 field service surgery schedule was full. The boy and his grandfather made the huge journey home with his precious appointment card and confidently returned for surgery during the folowing Madagascar field service. They had now walked for 15 days to get the help Fenosoa needed. Fenosoa is the youngest person from his isolated village to journey to the coast. It was going to be tough to explain a hospital ship to his playmates. He thought hard as he sat on his bed in the ward. “The ship is so big, it looks like a village!” he said. With a two-tooth grin, Papa Denis said they would take it easy after the young boy’s recovery from surgery – they would take six days instead of five to walk home … and set a slower pace! Relieved of his life-long burden, Fenosoa could not wait to get back to his village friends. Back to endless soccer matches and marbles – all of the rowdy games played by little boys around the world, regardless of the language they speak.